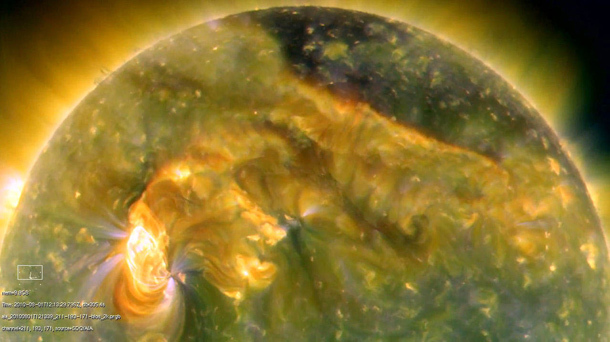 Our very own G2V star is the sun, or Sol, by the way. And as astronomers around the world are reporting, it’s getting kind of active with several large explosions of energy, called Coronal Mass Ejections, after a period of relative quiet. As Phil Plait says on his Bad Astronomy blog, “NASA’s recently-launched Solar Dynamics Observatory caught the action mid-eruption” and this photo is the result. Apparently there’s more Sol explode-y fun on the way over the next few years, as well.